Capit Pro, can capture high quality video and audio thorough USB. Plug and Play, no need to install driver and external power, can be used on PC or laptop computer. The main feature of this device is to capture TV, DVD, camera and other similar devices’high quality video and audio to computer. User can copy and edit the captured le on the PC, it can also work as home security camera if a camera is connected. 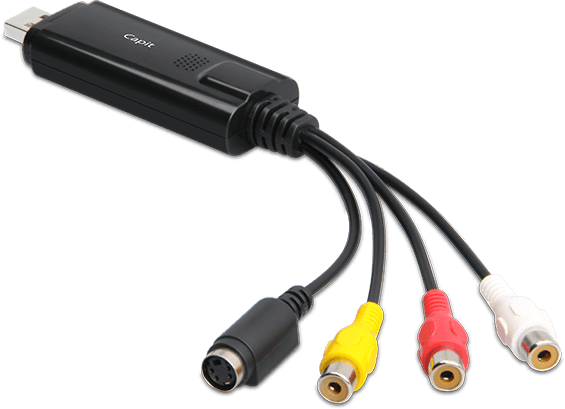 Capit Pro is the new USB 2.0 video capture device, with the multimedia decoder chipset, it gives you more clear, more smooth video and give you high quality audio without soundcard. 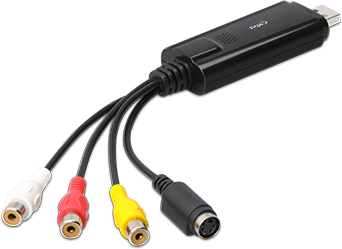 Capit is the capture equipment designed for capturing video source from VHS, V8, Hi8 and turn it to MPEG format videos.You can connect your device using either AV or S-Video connector, and Capit will auto detect if it is NTSC or PAL video.The recorded resolution can go up to 720×480(576) and you can easily turn the videos into VCD, SVCD, DVD or even upload the video to Youtube. Make your own DVD easily with high quality!